Tipper hire operations are coordinated from the heart of the UK. Our main depot and headquarters is based in Wolverhampton. From here we are perfectly placed to provide tipper hire in Birmingham and across the midlands. This depot also supports tipper hire in Manchester and throughout the North of England. With five ND Brown depots strategically placed around the United Kingdom, your construction or civil engineering project is never far from our tipper hire vehicles. No job is too large or too small for ND Brown. 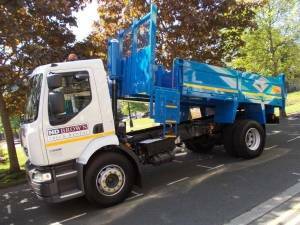 We supply tipper hire vehicles of all capacities and each with specific capabilities. We have been providing commercial vehicle hire for many commercial sectors. Tipper vans are ideal for the utility sector. When a project involves transporting materials, equipment, and personnel, these adaptable vehicles are just what you need. Suitable for accessing sites with restricted access, or the type of roads in cities and urban areas which a larger vehicle couldn’t. Available in single and double cabs with optional tool lockers. For bigger projects, there are a range of trucks to select. From 7.5 tonnes, to the giant 32 tonnes 8 wheel tipper hire lorry. There are HGV tipper hire vehicles with specialist features like the load cover. If you have uneven shaped cargo to transport, then the cage tipper fits the bill. When removing non hazardous waste, soil or demolished building materials on an industrial scale. A tipper grab is the efficient means to achieve this. We at ND Brown have decades of experience in supplying heavy duty commercial vehicles to civil engineering, construction, and highways agencies. Service and flexibility are at the heart of our tipper hire provision. Short and long term self drive hire options are available from us and we also have a collection and delivery service. Keep your project on schedule with ND brown tipper hire. Contact us today for a quote.